Day 12 of the challenge! Doctor Martin was no fool. He set about creating an elaborate greenhouse which would be the norm for a wealthy upper class and aspiring botanist. Anything to the contrary would be foolish, and draw unnecessary attention to the piece of land. With this in mind, he set about devising the transformation, with the utmost care. The regulated interior temperature was set to nurture the leafy luster of hundreds of plants. The humidity had to be perfect. After months of detailed care, the plants flourished and the eminent doctor heaved a sigh of relief. He was satisfied with the end result. Now he could turn his undivided attention to the real project, at the centre of the greenhouse. A trunk containing a variety of old documents, including an ancient scroll, had been unearthed. Highly classified results arrived via private courier. Expert analysis concluded that the high quality parchment dated back to the 1600s. It also bore faint marks that formed a sort of pattern or code. He opened the handbook and turned to the section which dealt with humidity. The sub-heading glared at him: factors to be considered in determining an optimum level of relative humidity for the display and storage of parchment. A parchment that needs just the right conditions to be read – it’s like a mystery. It’s flash fiction… for now… we’ll see. What else will they find digging? I like the idea of the parchment needing moisture to be read, like magic ink. Cool concept, and lovely photo! 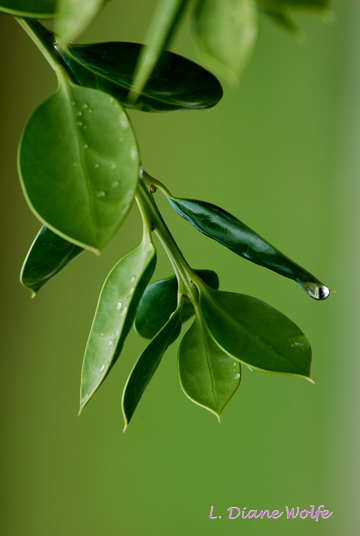 Just look at that water droplet on the leaf, amazing to catch it like that. I’m intrigued by the discovery, where will it lead, I think you have the beginnings of a book there. Beginnings of a book? Something to think about. I like your theme and the self-imposed restrictions. Selecting just the right words to capture meaning briefly is more challenging that writing a lot. It’s quite a challenge. But I’m really enjoying it. Now I’m inspired to dig some holes. Wifey may not like that so much. Ooo. How fun, digging up old documents. The preservation process. At first, the idea seemed strange, but then it all came together… there IS a specific humidity condition required for the display/storage of parchment. Ooh, finding treasure is fun! And what a clever way to preserve the scrolls. The preservation of scrolls idea has an element of fact. Love the ending. Thought it would be about a tree trunk. I did consider the “tree trunk angle” but couldn’t get it to work out. Glad you were caught by surprise. I have to wonder if it’s the start of something good or evil. Ancient parchments are always one or the other. Ooh, intriguing. Love the idea of a greenhouse as subterfuge. P.S. Gorgeous image by L.Diane! I love how this hints at more to come!! Others have asked the same thing….